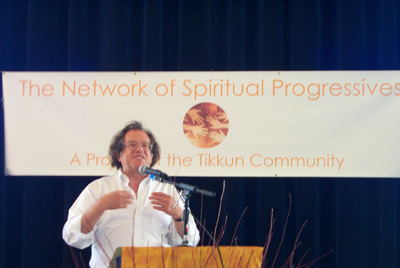 In July, I attended the four-day Tikkun (tee-KOON) Spiritual Activism Conference. Tikkun means to heal and transform the world. Spiritual Activism means putting love into action to create a culture of peace. This was my first visit to the famed Berkeley campus in the San Francisco Bay area. Berkeley was a hub of hippie activism and protests against the Vietnam War in the late 1960s when I was in high school on the northwest side of Milwaukee. After graduation in 1970, I moved to the East Side and was living with my oldest sister, Carol, who had been to San Francisco and was in tune with the times. I recall an incident when she acted in response to an article in the Bugle American, an indie newspaper published in Riverwest from 1972-77. The article suggested that one way to show support for Cesar Chavez and immigrant farmers was to go to your local grocery store, get a cart, put some bags of grapes in it, smash a frozen turkey on top of them, and leave it in the aisle. I watched as my sister, nine years older than me, did just that with as much wrath and rage as she could muster — in the Sentry store on Oakland and Locust. Fast forward some 30 years. I am in Berkeley, surrounded by 1,300 like-spirited and like-minded activists of various religious and spiritual persuasions from around the country. Many of them are hippies still, even the younger ones. I feel like I have come home. I am imagining what it would be like to live in a city full of people like this — what a vastly elevated existence it would be. I know that this is the world many of us hope to evolve into, and I feel fortunate to have a taste of what it might be like here at this conference. Lessons Learned “The Right is correct; there is a huge spiritual crisis in America. And the Left doesn’t get it,” said Rabbi Michael Lerner, an antiwar activist in the 1960s, editor of Tikkun magazine in Berkeley, and organizer of the conference. And with that, the conference began with the launching of a new initiative, the Network of SpiritualProgressives (NSP) to help bring about the spiritual transformation of society and politics in America. According to the group’s website, the purpose of the conference was “to send out a call for both the outer transformation needed to achieve social justice, ecological sanity, and world peace, and the inner healing needed to foster loving relationships, and a generous attitude toward the world; to encourage a habit of generosity and trust, and the ability to respond to the grandeur of creation with awe, wonder, and radical amazement.” The conference yielded insights often counter to the so-called wisdom of the status-quo. Lerner was heard to say, “What’s wrong with being girlie? Why shouldn’t we live in a society that values love and caring, generosity and kindness, and awe and wonder at the universe?” Another speaker stressed, “It’s time for the men to sit down and listen to what our sisters have to say.” We heard that “love your neighbor” means to love all your neighbors and that love is a moral value. There is only an “us,” not a “them and us,” so we need to speak in terms of good and bad ideas and not good and bad people. We need to be inclusive of all (even Bush!) and not to “demonize the other,” which causes further separation and polarization. Non-Violence — Inside and Out One workshop I attended was on how to be a mature Spiritual Activist in order to be of true benefit and service to others. In doing such work, it is important to be on the path of non-violence — both inner and outer. We need to consider our intention — is it to be right and win, or is it to be open so as to allow a new understanding to enter in? Right speech, harmlessness, spiritual practice, and the capacity to analyze world issues from a spiritual perspective are all important. Being a Spiritual Activist means having a regular spiritual practice. Self-healing is often necessary, and there needs to be a balance between the inner, spiritual world and the outer, material world. For inspiration, we can draw on the examples of Spiritual Activists like Gandhi, Dr. Martin Luther King, Jr., Cesar Chavez and the Dalai Lama. And for good measure, ground it all in the arts with beauty, imagination, and ritual. Riverwest As Parallel Universe On the first day, it dawned on me that many of the things they were talking about at the conference, we’re already doing in Riverwest. Things like being our authentic selves, living a life of meaning, connecting with our neighbors, and considering matters from a spiritual perspective for the greater good. A speaker said one way to get people to engage with each other is to start a farmers market. Sounds familiar. Riverwest is a Parallel Universe; that means it’s a place where people can make the ideal REAL, right now. It is quite amazing to me that, without any preconceived notion or accord, such a universe has been created in Riverwest, and that its attractiveness is drawing more folks here all the time. Riverwest is a microcosm of the conference’s spiritual vision. Riverwest has an inclusive spirit, which is embodied in the Riverwest Currents by the publisher, Vince Bushell, and editor Janice Christensen. Riverwest values neighborhood commerce, small businesses and neighborhood organizations. It supports local initiatives like the Riverwest Co-op & Cafe, Gardeners Market, Greenfolks Garden, the renovation of Snail’s Crossing Park, bike trails, street festivals, and our creative community of artists, visionaries, activists, peaceniks, healers, freelancers, writers, poets, musicians, drummers, and dancers. Riverwest As Spiritual Community Riverwest is also a Spiritual Community, a subtle distinction that I think has gone unrecognized until now, that gives it a unique perspective. Within my building and the one next door, there are four of us who meditate regularly. I was wondering how common this is in Riverwest, so I conducted a quick survey via RNAmail, our email network of 550 subscribers. Of the 31 who responded, most said they meditate or pray regularly (5-7 times per week). We bring this spiritual consciousness to bear on many community projects. And another opportunity has been presented for Riverwest to advance a spiritual perspective, through the city’s upcoming Northeast Side Comprehensive Plan. It seems to me that the hippies from the Baby Boomer generation are once more being called upon to help transform the world. I remember seeing protesters on TV in the 60s saying, “The whole world is watching.” And the whole world is watching again, this time through the power of the Internet, and the power of the people has grown (witness the millions around the world who are protesting the war in Iraq). While progress towards a more peaceful world has been uneven, it is still being made. Part of the reason the world is so polarized has to do with the tension caused by old energies going out and new energies coming in. There are those who are not quite ready for change, so they cling to the old conservative, fundamental ways. However, this change is inevitable, and we need to stay focused and centered on that. The more we commit to world peace, love, and compassion, the more that energy grows and expands. That is a universal truth – the more, the more. The hippies have progressed from raw youthful idealism to spiritual maturity and wisdom. The young people at the conference were asking to be at the table as peers with their Elders, and were also asking for guidance. So this is the work of the hippies today — to help the New Generation who will partake of the wine of peace made from the grapes of love, not wrath. There is so much more to tell. If this idea speaks to you, I suggest you go to www.tikkun.org. Click on the Network of Spiritual Progressives to learn about the new bottom line for economic and social institutions, pro-family initiatives, ethical consumption, ecological sanity, and more. Another Tikkun conference is planned for Washington, D. C. in Spring, 2006. It will launch a Spiritual Politics agenda for the media and politicians and train organizers who will take that agenda into their communities. Spiritual Woodstock Some said the Tikkun Conference could be the beginning of the spiritual renewal of America. Others said it could become as legendary as Woodstock. The conference concluded with all of us singing, “Imagine a Sisterhood of Man. You may say I’m a dreamer, but I’m not the only one. I hope some day you’ll join us, and the world will be as One.” So let’s keep on expanding our Parallel Universe. After all, “We are the leaders that we’ve been waiting for,” and we are steadily leading Riverwest into the new reality of the sacred in all. All dreamers are welcome to join us. Thanks to family and Riverwest friends who helped fund my trip, and to my gracious hosts, Craig Scott and Karen Paull, who allowed me to stay at their home in Berkeley.